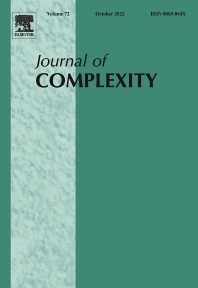 The multidisciplinary Journal of Complexity publishes original research papers that contain substantial mathematical results on complexity as broadly conceived. Outstanding review papers will also be published. In the area of computational complexity, the focus is on complexity over the reals, with the emphasis on lower bounds and optimal algorithms. The Journal of Complexity also publishes articles that provide major new algorithms or make important progress on upper bounds. Other models of computation, such as the Turing machine model, are also of interest. Computational complexity results in a wide variety of areas are solicited.